Hugely enjoyable, superbly written and impressively directed drama, featuring a pair of Oscar-worthy performances from Frank Langella and Michael Sheen. 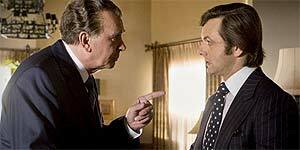 Based on the play by Peter Morgan, Frost/Nixon stars Michael Sheen as David Frost, a successful British television personality who's hungering after fame in America. When President Nixon (Frank Langella) resigns in 1974, Frost sees his opportunity and teams up with producer John Birt (Matthew Macfadyen) in order to request a television interview, anticipating a massive ratings success. Three years later, Nixon agrees to sit for a series of interviews with Frost, hoping to out-manoeuvre the British showman and rehabilitate himself in the eyes of the American people. And when the former President successfully snowballs the first interview by giving long-winded, self-serving answers, Frost's researching team (Oliver Platt and Sam Rockwell) become concerned that he might not be able to get the better of Nixon, reminding him that he's not known as Tricky Dicky for nothing. Frank Langella and Michael Sheen both reprise their stage roles for the screen and the results are extraordinary. Langella, in particular, is almost guaranteed an Oscar nomination for his performance as Nixon, which gets everything right, from his physical gestures to his speech patterns and even the way he walks – at times you would swear you were actually watching Nixon himself. Sheen is equally good and his impersonation of Frost rivals his impression of Tony Blair (it's hard not to chuckle when Nixon tells Frost he should have been a politician). There's also terrific support from a colourful cast that includes Rockwell, Platt, Kevin Bacon (as Nixon's right-hand man), Rebecca Hall (as Frost's girlfriend) and Toby Jones as legendary Hollywood agent Swifty Lazar. Morgan's script (adapted from his own play) crackles with great dialogue and director Ron Howard does a terrific job, ensuring that the interview sequences are genuinely nail-biting to watch. Frost/Nixon is a hugely enjoyable, beautifully acted drama that is by turns suspenseful, funny and emotionally engaging. Highly recommended.